I started playing guitar in the mid-eighties, in a time when the guitar hero thing that started in the 70’s was in full blown and, as every kid with six strings and a dream, I was in awe with all the virtuoso players I could get my ears on; from jazz-fusion wild pickers like Al DiMeola and John McLaughlin, to mad metal shredders like Yngwie Malmsteen and Paul Gilbert, it was an electric guitar Christmas from outer space. 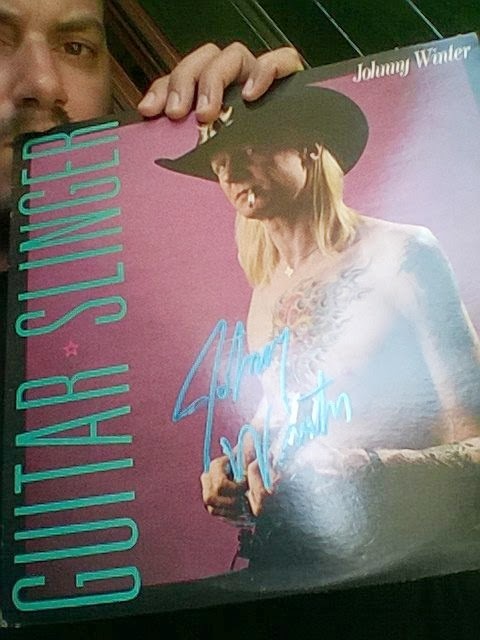 Johnny Winter was in a league of his own, from the tattooed outlaw albino image to the dazzling, incendiary fretwork assault; since i was moving my first steps on the instrument, I couldn’t figure much out of all those turmoils of notes and guitar histrionics but, at the same time, I was deeply fascinated. Even if, through the years, I mastered some of those iconic players’ tricks and their virtuosity was no more a language from another planet, Johnny Winter’s fluid blues phrasing is still a damn mystery to me to this very day; how he was able to fuse impressive technical mastery and burning intensity was beyond belief for anyone that knew a little about guitar playing, and he was revered by legions of world famous colleagues, and rightly so. If I had to choose some records from his rich catalogue for the ones that came to earth in these last days and still know little about the greatest Texan bluesman that will ever exist, I’d pick of his early two solo albums, “Johnny Winter” and “Second Winter”; the first simply because is one of the best blues guitar albums ever recorded, the second because is fundamental in bringing the blues into the rock era. Needless to say they both sound fresh and inspired as they had been recorded yesterday. Johnny Winter had just recorded a new album, “Step Back”, full of important guests paying homage, just in time at this point, to the blues Maestro who sadly passed away today, leaving a mark on the history of this humanity that nothing will ever erase and no one will ever forget. Johnny Winter: Facebook. / Webste. 17. July 2014 in Alle Royale's Rock Room, Global Texan Chronicles, Johnny Winter, music news, tribute.